For most of this season, the Heisman Trophy race has felt less like a competition between comparable candidates than a battle for second place. Ever since Lamar Jackson gutted then-No. 2 Florida State’s defense in a 43-point rout, the Louisville quarterback has been the clear leader for the award. The question from then on was not if anyone could keep pace with him, but whether Jackson would regress so that a different player could surpass him. If he maintained his Manziel-like statistical output, there would be no conversation. Jackson would win. But if he stumbled a few times, the prospect of an eleventh-hour Heisman heist remained possible. No month shapes voters’ perceptions of the race more than November, and whereas Jackson played his biggest games of the season in September and October (Florida State, at Clemson), other Heisman hopefuls could hope to benefit from opportunities to enhance their cases in momentous clashes against conference rivals. Those opportunities have come and gone, and the consensus remains the same, despite Jackson suffering two losses to end his sophomore campaign. He’s the best candidate for the Heisman, and that’s highly likely to be the case heading into the ceremony in less than two weeks. Whatever happens in conference championship games this weekend almost certainly won’t change who hoists the bronze trophy. This was the week Jackson was supposed to make his closing argument and leave no doubt in voters’ minds when they filled out their ballots. The previous week, he’d completed less than half of his passes and scored only one touchdown in a 26-point loss to Houston. That defeat obviously didn’t help his chances, but it also marked Jackson’s last matchup of the season against a respectable defense. In the Governor’s Cup, he’d face a Kentucky unit ranked 87th in points allowed per game and 84th in Football Outsiders S&P + ratings. As expected, that defense couldn’t contain Jackson, but that didn’t prevent the Wildcats from pulling off one of the biggest upsets of the season. Though we saw flashes of the Jackson that dazzled with laser-beam throws and long, weaving runs in September and October, he also tossed three interceptions and committed the fumble that led to Kentucky’s winning field goal. It’s true that the fumble looked questionable upon review, and one of the picks was definitely not Jackson's fault. Still, a three-point loss to a 26-point underdog at home isn’t the way Jackson envisioned putting a bow on his campaign. That said, he remains in a comfortable position. The level of uncertainty involved in projecting the final results of this Heisman race is far lower than what attended a more significant selection earlier this month. It’s just really difficult to see another player garnering enough support to supplant Jackson at No. 1. One candidate who can improve his stock before ballots are cast is Mayfield, who will lead the Sooners in a tilt against in-state rival Oklahoma State with the Big 12 championship on the line. Mayfield should be able to gash the Cowboys’ porous defense, and he remains near or at the top of the leaderboard for several statistical categories (passing efficiency, yards per attempt, completion percentage). Yet even a pristine performance in a blowout win over Oklahoma State probably won’t make much of a difference at this point. The problem for Mayfield is that he may not be the best candidate on his own team. Wide receiver Dede Westbrook has justifiably garnered consideration for the Heisman, and the Sooners have put together a cool digital feature promoting both of them. For many voters, the argument over which player is more deserving of the award hinges on who has been more important to Oklahoma’s success this season, an MVP-style quandary that adds another layer of complexity to a debate that already incorporates other nebulous elements like program prestige and national visibility. Mayfield plays a “more important” position, but that doesn’t detract from the fact that Westbrook has spent most of the season giving defensive coordinators nightmares while putting up stunning numbers. Perhaps there’s no right answer: Both Mayfield and Westbrook should have your attention. No candidate did more last week to reassure voters (or, at the very least, this voter) of his legitimacy as a Heisman contender than Browning. 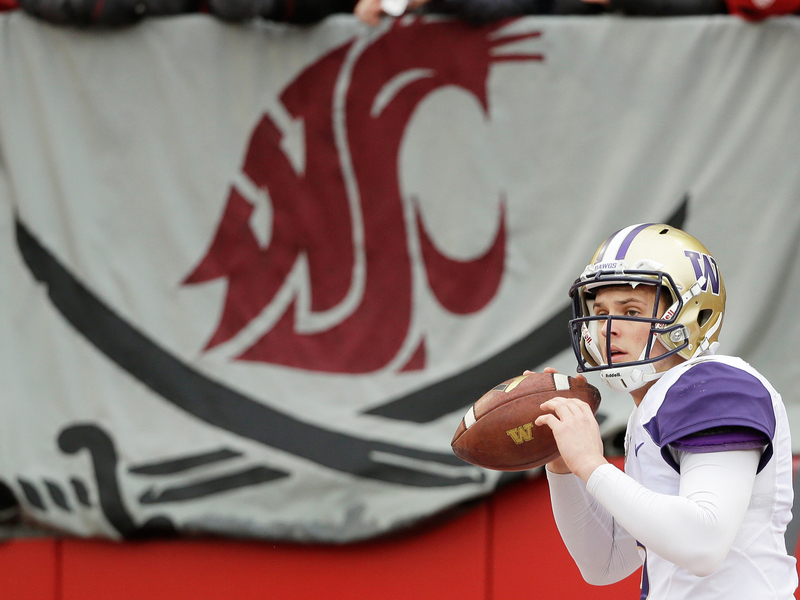 In a daunting road test with a division championship at stake, Browning roasted Washington State with 292 yards on 21 of 29 passing with three touchdowns. His surgical dismantling of the Cougars’ defense turned a game billed as Washington’s biggest roadblock to a College Football Playoff berth into a laugher by the end of the first quarter: Browning tossed three touchdown passes over an eight-minute stretch to give the Huskies a 28-3 lead after the opening 15 minutes. Washington would cruise to a 45–17 victory. The irony of Browning’s masterpiece is that it may have actually diminished his chances of drawing enough support to earn an invitation to New York. Washington was so dominant against Washington State that the game seemed more like a non-conference tuneup than a critical clash with a longstanding rival. That’s a shame because Browning really should be considered one of the nation’s most outstanding players not named Lamar Jackson. The only major dent on his résumé is a 13-point loss to a USC team that, were playoff teams chosen strictly based on their capacity to win head-to-head matchups (it’s not), probably would have a spot in the final four right now. Other candidates, including Jackson, have endured more tumultuous games or stretches of play and repaired their stock in short order. Browning should be treated the same way. Watson is that band you streamed so often after an album release that you got sick of it, only to later realize that your newest playlist feels empty without a few of their songs. He belongs in the conversation for the Heisman. There were plenty of bumps along the way, most notably his head-scratching goal-line interception in Clemson’s one-point loss to Pittsburgh earlier this month, and he finished the regular season among the nation’s leaders with 14 interceptions. While Watson's penchant for giveaways remains a black mark on his Heisman CV, at his best he’s probably the top dual-threat quarterback in the country. He definitely looked like it Saturday against South Carolina, when Watson completed a season-high 82% of his throws for 347 yards with six touchdowns against only one pick. If he can even come close to hitting those marks in the conference championship game against Virginia Tech this weekend, Watson’s case will be pretty solid. He may have the most hope of any candidate to unseat Jackson, given his victory in a head-to-head battle with Jackson and his national profile. It’s a long shot, but maybe Watson can make it interesting. It was never fair to expect McCaffrey to match his production from last season, when he broke Barry Sanders’ record for all-purpose yards. Stanford’s super junior set such a high bar that he probably wouldn’t have cleared it even if the Cardinal maintained his hefty workload. That became impossible when McCaffrey missed time due to an undisclosed injury, but since returning he’s provided no shortage of material that would fit nicely in his 2015 highlight reel. McCaffrey has recorded more than 220 all-purpose yards in each of his last five games (he had 271 in Saturday’s rout of Rice) and enters the postseason averaging more yards per carry (6.3 to 6.0) and yards per punt return (9.6 to 8.7) than he did as a sophomore. The disparity between his topline statistics in 2015 and 2016 isn’t the only reason McCaffrey will probably have to settle for watching the Heisman ceremony on television. Stanford’s jarring tumble from the playoff picture diverted attention to other candidates, including one with whom McCaffrey shares a conference (Browning), who made a quantum leap in the Heisman race thanks to a 38-point thumping of the Cardinal in September. But McCaffrey finished the regular season on a roll, and he should be recognized for his achievements even if they don’t stack up favorably to what he did a year ago.